* As soon as you open the box, you get a whiff of sweet caramel. * The caramel is neither cheap-smelling nor synthetic, it’s what I would imagine a Guerlain caramel would smell like for their Les Elixirs Charnels line. * The candle burns incredibly cleanly with no smoke. When distinguished, there is a light smoke trail but it dissipates quickly. * The throw of the candle is quite good – it fills the room nicely without being too strong. The scent also lightly drifts into adjacent rooms. * As the scent develops, the caramel is joined by some spice (cinnamon/allspice) and some light earthy wood. Summary: I was at the New York International Gift Fair and I will admit that I was overwhelmed by the amount of candles on display. We joked that we were “soy-candled to death.” One that stood out to me was Dulce Caramelo – for its delicious gourmand scent and also the shiny silver container. My first association was one of my favorite Guerlain fragrances – Gourmand Coquin, which is the most amazing sweet white/milk chocolate smell you can imagine. I wish Guerlain would do a caramel for the Les Elixirs line with the Dulce Caramelo smell. 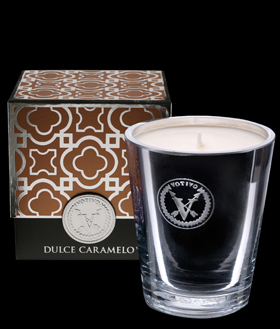 Votivo candles are available through the Votivo website and authorized retailers. Disclaimer: Candle sample provided by Votivo. Image courtesy of Votivo website. I’m glad you survived the bombardment of soy candles.